TO RECIEVE THE 10% DISCOUNT FOR March or April. YOU MUST MENTION IT IN THE COMMENTS WHEN BOOKING OR BY EMAIL OR PHONE PRIOR TO BOOKING. IT CAN NOT BE HONORED, UNLESS MENTIONED. Casa del sol is one of the best Clearwater Beach Rentals in the Florida Gulf Coast Central, only minutes away from the famous sands of Clearwater Beach. 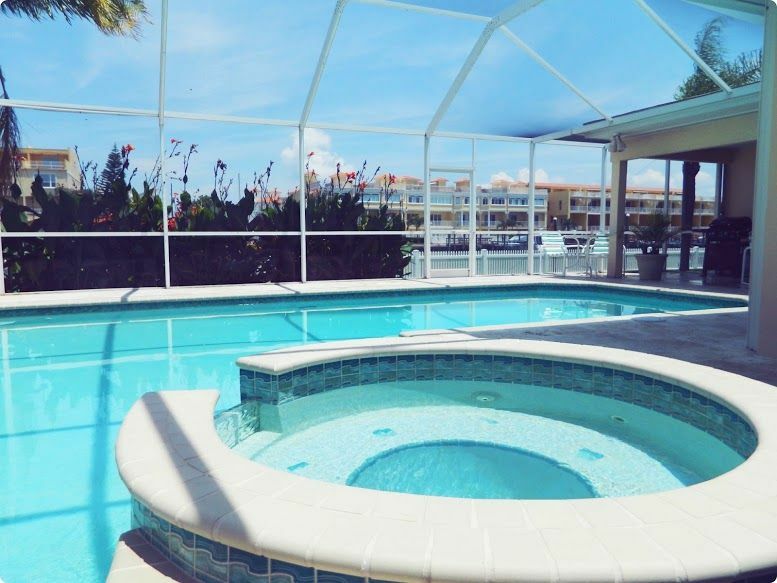 This bright and cheery Florida Vacation Rental home features 3 bedrooms, 2 1/2 bathrooms, private heated pool, hot tub (pool heat can be added for $30 per night or $150 for a week) and breath taking views of the bay. This Clearwater beach rental home is the perfect rental home for a family of 12. You will enjoy this cute Florida Vacation Rental and its many unique amenities, both inside and out including a full gourmet kitchen with wet bar, wireless internet, flat screen TVs in each room, and private laundry room. Both the kitchen and living room area have an amazing unobstructed view of the bay and pool area. This home has a fabulous spacious outdoor patio, can serve as an outside dining area, alongside an L-shaped heated pool, hot tub and backyard boat dock. This Clearwater Beach Rental makes the perfect get away for snow birds and vacationers. This perfect 3 bedroom, 2 1/2 bathroom beach home is nestled in an upscale area, only short walk to the beach or Pier 60. Spend the morning relaxing in the backyard or walking for miles along the sandy beach, just minutes from your door. Everyone will appreciate the convenient and quiet location in the beach area, close to beaches and downtown Clearwater. High end quiet neighborhood near Pier 60, upscale shopping, great formal and casual restaurants, and plenty of activities. Family friendly Florida Beach Rental and non-smoking the huge clean beach rental, updated interior and exterior will suit everyone. This is one of our most booked homes so please book in advance. We have last minute specials and special price cuts on cancellations. Lowest prices in Sept., Jan., Oct., and Nov.
Nice property. Great location to everything. Mother Nature wasn't nice----But the house was fabulous!!! This house was fabulous! We had 9 of our senior softball players in the house and it was quite roomy. There were enough beds for everyone! The location is great, we walked to a few of the bars on the beach, only a few blocks. Unfortunately, the weather was too cold and nasty to enjoy the hot tub and pool. We tend to do a lot of cooking when we travel and needed a few more items in the kitchen, Valerie was spot on and brought everything we needed. The grill was great, washer and dryer are super nice front loaders, lots of sitting area to socialize in the living room. We had an absolute blast even though the weather was so bad. Valerie provided enough dish soap, dishwasher pods, and washing machine pods to cover the 5 days we were there. Overall it was a great vacation/softball tourney. Thank you!!! Overall the rental house and its location were excellent. We did order pool heat but only the spa reached a warm temperature. We were disappointed that the swimming pool could not be used. Traffic was not too heavy and we were able to get around easily. The house was great for our family group. The pool people and gardener were friendly and efficient. Valerie was informative and helpful. Great stay overall. The property was just as advertised. Very walkable location, clean, pool and hot tube were great. The management staff did a great job of communicating and making sure we were all taken care of. The Casa Del Sol house was great. The pool and hot tub were awesome. It was located really close to the beach and restaurants and shops. My only complaint would be the uncomfortable beds. They were hard, lumpy and very noisy to lay on. I read a review that complained about the beds, but I was hoping that management had bought new ones. When you spend 1/2 of your vacation sleeping, the mattress is so important. Please buy new mattresses, and this home would be a 5 star!! All rates may be negotiable. Please call us for last minute discounts.